The Irish bouzouki is a relatively new instrument, dating to the 1970s. It’s a variation on the traditional Greek bouzouki with a flat rather than rounded back and four courses of two strings each, with the two strings in each course often tuned in unison (my preference) rather than an octave apart. 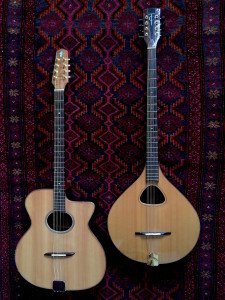 The most popular tunings for Irish bouzouki are GDAE (like a mandolin, but one octave lower) and GDAD. In 2011, I traded an archtop guitar for my first Irish bouzouki (zouk), the Trinity College 675 series on the right in the photo. I quickly discovered its unique quality — nothing sounds quite like it — and it became my favorite instrument after the guitar. The TC zouk sounds like a woody, double-coursed banjo when finger-picked and kind of like a mountain dulcimer when strummed. Its special timbre spawned several new songs in the first few months I had it. My only minor complaint, if I could call it that, was that the long scale length (26 3/4 inches or 660mm) and the very narrow neck (1 1/4 inch nut width) demand skill and hand strength. Some chords can be hard to play. The small body and carved, slightly arched top also mean that this zouk doesn’t produce a lot of volume — an issue I solved by installing a K&K passive pick-up. To address the action and volume challenges, I ordered a custom-made, guitar-shaped zouk (on the left in the photo) from New Zealand luthier Paddy Burgin. The scale length is significantly shorter (620 mm), which means the strings aren’t so tight and have a longer sustain, and the neck is wider (1 1/2 inch nut). Both of these factors make it easier to play. The body shape and the flat top give this zouk more volume and a timbre more similar to a guitar — a bit like a 12-string without the lower strings, but warmer, because I use unison strings rather than strings tuned an octave apart. Since I have the luxury of two zouks, I keep the TC tuned to GDAD and the Burgin to GDAE. The GDAD tuning is great for accompanying Irish tunes, but is also good for other songs in which I want to add some melody or quickly change chord voicings as I play. It functions more like an open tuning, with some good drone effects, and is especially effective in the keys of D and G. Because the zouks have distinctly different tone qualities, I decide which one sounds good for a particular piece and use that, although I can do everything I play on either of them if need be. I’ve become a huge fan of the Irish bouzouki, because it allows me to produce songs and sounds that are unique and pleasing. My musician friends all compliment the tone and versatility of these of these two instruments. Zouks also generate interest on the part of an audience — something different. That’s always welcome! Austin singer-songwriter Greg Engle, a career diplomat, has led a life of constant travel. He’s witnessed attempted coups, had lunch with Nelson Mandela, and seen two African dictators fall. Four songs on his debut album (2010), "Take It Personally," provide colorful accounts of his many years in Africa. He is a founding member of the East Coast-based Duke Street Liberation Army Band, which released its debut album, "Arsenal of Love," in 2014. Engle won first prize in the 2011 Woody Guthrie Folk Festival Songwriting Competition. His songs have played on radio programs around the U.S. Engle and veteran Austin musician and producer Stephen Doster have performed and conducted songwriting workshops in Swaziland (2012) and Lesotho (2015) as part of the U.S. State Department's Arts Envoy program.